Hello and welcome to the world of Gowling Stairs! To us stairs are far from mundane, nor are they just a structure linking two floors. “Stairs are statement makers, they can help define the style of your home and create a grand entrance”. Stairs have multiple uses, you can sit on them to tie your shoes, use them as a fitness tool, multipurpose them for storage, or race toys down them. What’s more they look much funkier than a ramp! So, after 25 years in the industry and 30,000 projects under our belt it's fair to say we live and breath stairs! At Gowling Stairs we pride ourselves on crafting beautiful stairs that withstand the steps of time. Today we have a 30 strong team who currently manufacture over 2,000 staircases per year. All of our staircases are manufactured in Australia using locally sourced timber. Gowling Stairs is proud to have strong partnerships with a number of Australia’s largest and most prestigious residential builders, and our staircases have been featured on Channel 9’s “The Block”. Gowling Stairs is an Australian owned and operated company with the showroom and factory based in Vermont, Melbourne. We service all parts of Melbourne, as well as country Victoria and New South Wales. Step up with Gowling Stairs! Be inspired. 1. Send through your floor plans with specifications and/or an image of a similar staircase you like. For advice or inspiration please visit our showroom and we will be more than happy to provide you with technical advice. 2. Once a Purchase Order is received an order will be placed. One week’s notice is required for a site measure to occur. Our normal lead time for installation is always 4-5 weeks from time of final site measure. 3. A sketch of the stair layout will usually be sent for approval along with confirmation of all details prior to manufacture. A secondary measure may also be required if any changes/alterations were requested to be made by our site consultant. 4. The staircase will be placed into production once an accurate indication of when plasterboard will be 100% complete and thus ready for staircase installation. Our Installation Manager will stay in close contact with you over this period. Installation will usually take place within one day however larger jobs may spread out over a few days. Shiv is the Director of Gowling Stairs and is responsible for managing the entire cross functional aspects of the business; Manufacturing, Finance, HR, Legal, Marketing, Operations and Supply Chain. 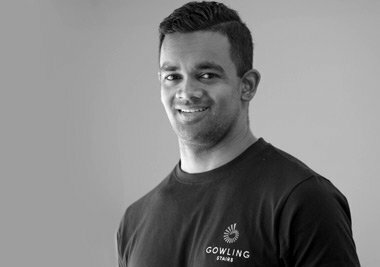 As the leader of the Gowling Stairs team, Shiv is responsibile for ensuring the ongoing growth of the business whilst managing the current project portfolio. Shiv is a Chartered Accountant with a Bachelor of Business (Accounting) from Monash University and he has worked for professional services firm Ernst and Young and as a Finance Executive for iSelect. Shiv is happily married with 2 young children and enjoys spending time with family and friends, travelling, and is an avid supporter of the Essendon Football Club. Geoff is the Director of Gowling Stairs and is primarily responsible for overseeing the whole manufacturing process from site measure through to delivery. As a leader within the business he is focused on offering clients solutions beyond their expectations whilst also staying within a comprehensive project program and budget. 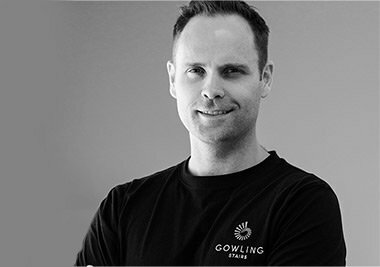 Geoff is an experienced construction professional and manages the quality control process to ensure each project is manufactured and delivered in a timely and efficient manner. He frequently liases with the production team to raise the level of professionalism and ensure the business is utilising the latest technology in the manufacturing process to provide certainty over project delivery. Geoff comes from previous career in the health services industry where he ran his own business. He is happily married with his wife expecting a child this year; he enjoys spending time at the beach, relaxing with family and friends, and walking his dog. 1. What is the normal process for ordering a staircase? 2. What is the cost of an average staircase? This is a hard question to answer, as staircases can range in price from about $2000 all the way up to $50,000 depending on the materials used and labour involved. As a guide, most of our clients spend between $3000 and $5000. 3. How long does it take to install a staircase? Although most staircases can be installed in a day, some larger projects may take two days. It should also be noted that the stairs cannot be walked on for 24 hours after installation to allow the glue to dry. 4. Will my stair squeak and/or creak? Staircases will never creak/squeak if they are installed correctly and fitted with the appropriate amount of wedges and glue blocks. It is always recommended that you don’t walk on new staircases within 24 hours of installation to allow the glue to dry. In the event that creaking occurs, this can generally be fixed fairly easily using additional/replacement wedges and glue blocks. 5. Can you install glass balustrading? Yes, this is one of Gowling Stairs most popular balustrading options. Visit our balustrading page for more information or get in touch to discuss your needs in more detail. 6. Can you repair/renovate existing staircases or replace balustrading? Repairing and/or renovating staircases and balustrading can be a complicated job that is based on many factors. We review each request on an individual basis, so please get in touch. 7. What sort of timber do you use? We use a wide range of timbers such as MDF, Pine, Victorian Ash and Tasmanian Oak. We can also manufacture staircases from a number of exotic timbers (such as Spotted Gum, Blackbutt, Sydney Blue Gum, American Oak and Brushbox). Our showroom contains samples of each species we have on offer. Visit our timber types page for further options or get in touch if the timber you desire is not displayed. Note that we only supply select grade timber with our hardwood and we do not use veneered timber. 8. I want to lay tiles/flooring over my staircase. is this possible? We can provide a staircase made from either Pine or MDF, which is suitable to lay flooring materials over. 9. Do you work outside melbourne? We service all areas of Victoria and even have a number of clients in New South Wales. Get in touch to see if we service your area. 10. What information do you need to provide me with a quote? We require ground floor plans, first floor plans, specifications and staircase detail (if available).